Amy and I have a daughter, Chloe, and a son, Calvin. We live on a hobby ranch with horses, goats, chickens, ducks, cats, peacocks, one steer, rabbits and many dogs. I started in the Ft. Nelson Sled Dog Association 27 years ago. I've been a long time member of ISDRA, North Star, ASDRA, ADMA and many other clubs. Currently president of the Frazee Minnesota Sled Dog Club. I enjoy helping to organize races. I specialize in Open Class and have competed and won races from 3 to 50 miles. 27 consecutive years racing open class. Acquiring two crossbred husky pups at the local annual sled dog race. 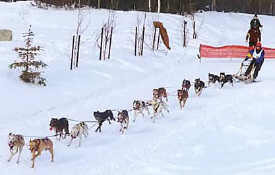 My first race --I was 14 years old, on a new sled, driving the biggest team from 8 to 16 dogs. I lost the team, got picked up by my dad, who was in the only race he would ever run. My dad got off the team with five miles to go and let me drive to the finish line. So I made it around the trail, but it took two teams to do it! Who knows-if I'd been the one to get a ride in the vehicle the last five miles, maybe I would have been disheartened and quit then and there. 1. Adolfus Capot-Blanc - Ft. Nelson Native Indian and local mushing star. Gave me free of charge Tanda, a female � Sibe, � German Shepherd leader that won Yellowknife. Tanda was the mother of our super leader, Lucy, who made the name Streeper famous in the mushing world. Harris was awesome in my eyes for many years. I envied his medical knowledge about the dogs. Peter had the biggest affect on me of all my mentors. He taught me how to make dogs tough enough to handle race pressure and how to run hard around the entire race course rather than saving until the last two or three miles before asking the team to drive hard for the finish line. 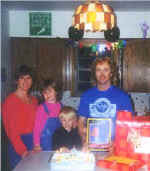 Peter Norberg was the first Canadian to win the Open North American in Fairbanks. I was the second. Peter never raced Anchorage but won many open and mid-distance races in his short career. George taught me in the beginning how to be dedicated and devoted enough to be able to beat him and win the Anchorage Fur Rondy. He also taught me the fact that super dogs, no matter what, get old fast! Gareth taught me to enjoy the wheeling and dealing aspect of the game. To dicker and barter for the fun and money. We maintain between 70 to 100 dogs counting puppies. We use 2 inch pipe--four feet in the ground, two feet above with a piece of rebar (two feet in the pipe with an 18 inch arm) inserted into the pipe. We have sand and dust, so it's nice to have the chains off the ground. Our dog dishes set on four-sided 2" x 6" frames. It saves wear and tear on the dishes and is harder for the dogs to kick around. 1) A tethered dog gets more exercise than a kenneled dog. 2) Standing on ground is easier on the shoulder muscles and joints than cement or wood flooring. 3) A perimeter fence around females for sure, and hopefully the entire dog lot, is wise for safety with loose dogs. We feed 85% meat, 15% cereal, eggs, bone meal, and vitamins. Proper diet is key to a super team. 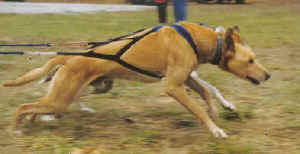 A combination of many hound lines crossed in with a few Canadian and Alaskan husky mixed breeds. All of our dogs currently are 6 to 15 generations down from dogs that I used to win many races, on one side or both in bloodlines. I like sensitive type dogs with smart brains. I don't like belligerent, stupid dogs. My all time favorite dog - Lucy (Super Dog Deluxe)! She led our main string for 10 years. Never lame - never missed a meal. Never sick - never missed a race. Won Anchorage and ONAC running every heat on lead. Had first litter of pups at 10 years old. She was � German Shepherd, � Siberian and � Wright Alaskan Husky. She won many, many races of different lengths including three 50 mile heats in Yellowknife, NWT. We breed on performance only unless we run out of a certain line we want to hang onto. Too many mushers breed by bloodlines alone. Regardless of the bloodline, I feel individual performance must decide or prove who should be bred to improve overall performance. Not really. We just keep an eye on them as soon as they can move around. We start handling pups early. Once they're weaned we call and run them around in big pens. When the pups are 6 to 8 weeks old we take them from pens for longer but short runs. Once the pups can outrun us on foot, we let them chase the four wheeler. We introduce pups to harness at 4 to 6 months of age. We have a pretty good idea after one year, but there are always exceptions. To train hard, steady and to be competitive in every race we enter. We like to have the dogs up to a certain mileage and speed at certain times in the calendar year if possible. To get the dogs ready to withstand all conditions they will encounter, including mileage and heat factor. Cable ganglines in the fall, the G-line (also known as a snub line) on my sled and the Indian quick release, good snowhook and training sled. The 4 wheeler was a big step forward compared to wheeled rigs with no speed control or reliable brakes for big teams. We like to let the team dictate which races to enter unless a personal reason arises. When the team is strong I like to race at the oldest, most prestigious races. My biggest strength now in my career is my experience. I've been in a lot of haywire situations with my dog team and had to learn how to get back on track, fast! My biggest weakness is probably lack of financial backing. I hate most monthly bills that life causes. � Do you having a mushing career goal? To be remembered after I'm gone! Good dogs, good food, good training, and good luck! These are the four main ingredients to a winning team. I think the sport will continue to grow in all aspects. I hope the Olympics will have sled dog racing in my lifetime. I would like to see pari-mutuel betting allowed at certain races. 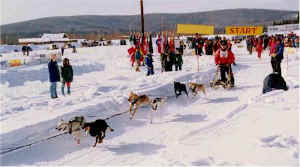 I would like to see more mushers help put on a race. Most races need more volunteers and the mushers know what it takes. Without organizations and clubs we will never be allowed into the Olympics. People need and want guidance in many areas. Be very careful whom you pick for mentors. Try to be honest with yourself with expectations for your team. Don't cheat your training program and blame the dogs. Always be aware of your worst dog and try to improve or replace that dog. Don't get too many dogs too fast. Right from the start try to appreciate and respect the dogs. Many years ago my brother and I hooked up 34 dogs to a little all-steel sled with one snowhook. We drove the team 3 miles just for fun, with each doing 1 � miles. When I won the 50th "Golden Anniversary" of the Anchorage Fur Rondy, I was the first Canadian to ever with the race-it was awesome! My first mass start race was a real thrill and I still enjoy them.